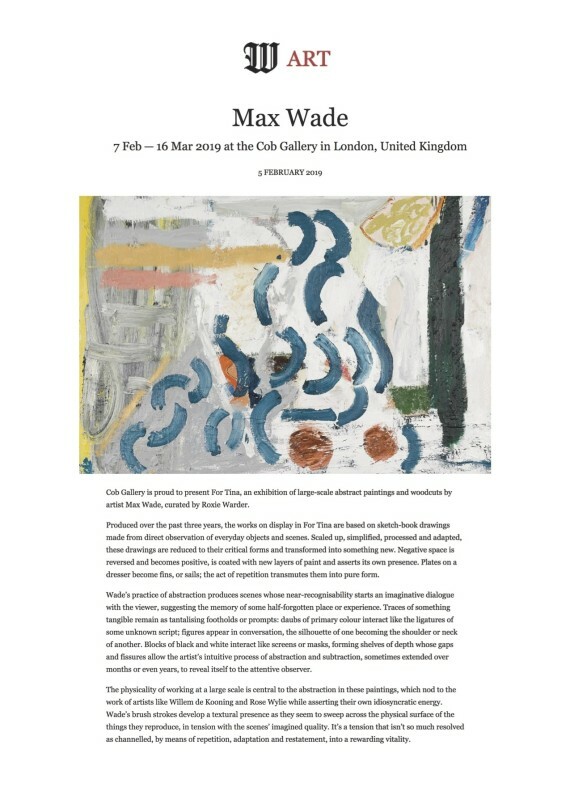 Cob Gallery is proud to present For Tina, an exhibition of large-scale abstract paintings and woodcuts by artist Max Wade, curated by Roxie Warder. Produced over the past three years, the works on display in For Tina are based on sketch-book drawings made from direct observation of everyday objects and scenes. Scaled up, simplified, processed and adapted, these drawings are reduced to their critical forms and transformed into something new. Negative space is reversed and becomes positive, is coated with new layers of paint and asserts its own presence. Plates on a dresser become fins, or sails; the act of repetition transmutes them into pure form. Wade’s practice of abstraction produces scenes whose near-recognisability starts an imaginative dialogue with the viewer, suggesting the memory of some half-forgotten place or experience. Traces of something tangible remain as tantalising footholds or prompts: daubs of primary colour interact like the ligatures of some unknown script; figures appear in conversation, the silhouette of one becoming the shoulder or neck of another. Blocks of black and white interact like screens or masks, forming shelves of depth whose gaps and fissures allow the artist’s intuitive process of abstraction and subtraction, sometimes extended over months or even years, to reveal itself to the attentive observer. The physicality of working at a large scale is central to the abstraction in these paintings, which nod to the work of artists like Willem de Kooning and Rose Wylie while asserting their own idiosyncratic energy. Wade’s brush strokes develop a textural presence as they seem to sweep across the physical surface of the things they reproduce, in tension with the scenes’ imagined quality. It’s a tension that isn’t so much resolved as channelled, by means of repetition, adaptation and restatement, into a rewarding vitality.